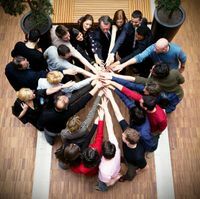 In the current lingo for most corporate settings, the word “department” has been replaced with “team”, implying a shift from the disconnected, corporate machines of the past to functional groups working cohesively. The concept of team-playing and teamwork remains a central focus of many job interviews. How you address questions aimed at assessing your team skills, will give a potential employer an understanding of how you will add value and successfully integrate into the open position. Prepare for an upcoming interview by considering some of the many questions that provide an opportunity for you to market your team skills to any seasoned interviewer. Provide a specific example of a time when you supported a team to execute a successful task or project. The Intention: When a prospective employer is asking you a question on your role in supporting a team, he/she is testing you to see whether you claim a leadership role or a supportive role. While the interviewer is not asking if you are a leader with this question, he/she is asking whether you are capable of effectively working on a team. The Response: Avoid injecting your ego into the response. While it is tempting to always highlight your leadership abilities, take this opportunity to discuss how you support your colleagues and supervisors. Use a specific example to demonstrate how you are able to interact with different departments and roles. In the example give credit to your former colleagues for their efforts. Finish the example with a comment on how this was one instance where you were in a support role but that you either feel comfortable taking the lead on a project or that you have taken the lead on projects in the past. Have you ever managed a project? The Intention: This question essentially assesses where you are in your career path. If you were not in a management role in your last position, many times potential employers will ask this question in order to ascertain if management responsibility has been conferred to you in the past. The Response: If you have had the opportunity to take on the leadership role in a team, take this opportunity to discuss your leadership skills with a specific example to show that you are an effective leader. Also mention that you are comfortable supporting a team and that you worked with the same colleagues in a variety of roles, from leader to follower, in order to build in the interviewer’s mind your team-playing spirit. If you have not had the opportunity to lead a project or task, be honest but offer an example of when you have been successful in leading an independent task or of how you have been assigned responsibility progressively in your career. Provide a specific example of a time when a colleague was not performing on a project or task and what you did to support their success on the task. The Intention: With this difficult question, the interviewer is most often trying to associate something specific with your promises of being a team-player. Oftentimes, employers are most impressed with individuals who are able to perform on a team without eliciting negative feelings from colleagues. The Response: Your response to this question should detail a time when you helped a colleague in need. In order to demonstrate how you support your team, cite an example where you stepped in to help a colleague who was struggling but did not use it to ingratiate yourself with management. How do you see your fit into this team? The Intention: With this question, the prospective employer is assessing your understanding of the position and your ability to assimilate into the existing team structure. Knowing that you cannot possibly understand how the team interacts, the interviewer is asking this question in order to understand, one, if your skills match the position and complement the existing skill set, and two, if your soft-skills are malleable enough to mold into any essential role which is currently void. The Response: Approach the response to this question keeping in mind that a complete answer must address both your hard-skills and your soft-skills. For example, you might cite that you are coming into the position with the content knowledge and competencies required to carry out the duties associated with the position as well as the team-spirit to fit wherever necessary to ensure that the team and the company is successful. How do you handle issues with colleagues where there may be negative feelings? The Intention: Personal feelings aside, can you work towards success with colleagues who have opposing personalities? This question aims at the heart of how you resolve conflict within a team. The Response: A great response to this question highlights your ability to minimise your personal feelings while in the workplace. Try approaching this question with a statement demonstrating how you segregate your personal feelings from your professional decision-making and interactions. Insist on how you do not allow your pride to interfere with performing on a task. Take advantage of this opportunity to describe your skills in diplomacy. Who was your favorite manager or supervisor? What traits did he/she have that made her a good or effective leader? The Intention: This question provides the interviewer with several important insights on a job-seeker. Prospective employers are looking for great candidates who can lead and follow, who can identify leadership traits, exercise them, and fall in line to follow when these skills are demonstrated in management. This question also provides the interviewer with a hint on your feelings on your most recent supervisor and a basis from which to judge what you expect in a manager. The Response: If at all possible, respond to this question praising your most recent supervisor for his/her excellent managerial skills, no matter how you really feel. Choose two or three specific leadership skills and assign them to him/her and provide specific feedback on why these skills led to the functioning of a successful team. For example, you might say that your former supervisor was a great leader because not only did he/she act as a great resource of support with an open-door policy, but also that he/she always stood by her people. Always mention how much you learned from him/her. At the face-to-face interview highlight your team-building and team-support skills while also managing to successfully portray your strengths and weaknesses. Take advantage of these questions to formulate responses that promote your willingness to work cooperatively and show potential employers that you are an asset to their teams.